This is the discussion related to the wiki page	SCP-059. Has SCP-500 been tested on this? It's not in the SCP-500 test logs, so I doubt it. Anyway, the pathogen is unique to SCP-059, so running tests is probably more trouble than it's worth. It's easier to just stick the thing in a vault and forget it. Besides, those pills are exceedingly valuable. Probably true. It's a matter of concern about alternative outbreaks, though. I don't think that we can ever safely assume that any of the SCPs we have is the only one of its kind. We have a moderate success rates in tests using duplicates of the SCP-500 tablets produced from SCP-038. Huh. I'm surprised this one hasn't gotten more votes one way or the other. 1. That is, of course, unless the whole radiation thing counts as failing the locked box test, in which case it would be euclid. Count me surprised on the lack of votes, as well. Upvoted, with the reservation that it should probably be reclassified as either safe or perhaps euclid (given the lack of data on transmissibility). Better than another child's doll or something. I find some of the slightly more SF-nal pieces work better as more abstract shapes instead of everyday objects. (if you don't/can't watch the video, it's a water bottle with a built-in UV thingy to disinfect water). Might work because it both makes radiation normally (so it's not completely WTF when it does) and it would be ironic if it actually caused a fungal infection. It would still be on nonstop, of course. On the other hand, delta_vee does kind of have a point. Phase profile, thermal conductivity, and electrical conductivity are unknown. What, the Foundation can't spring for a THERMOMETER and an OHMS METER? Lack of data on thermal and electrical conductivity doesn't bother me - the given radiation figures are (given an assumption - see below) enough to melt most, if not all probes used for those purposes. 250 kW/m^2 is the blackbody radiation of a material at about 1600 K. It'd have to be one heavy-duty probe to actually get close enough to touch the thing. Forgive me for science pedantry, but my problem is the unit selection - kJ/s/m^2 should be kW/m^2, and that's a unit for irradiance (power incident on a surface), rather than what the author's probably looking for, which is radiant intensity (watts per steradian, or W/sr) or radiance (W/sr/m^2). Bottom line, though, is that the thing is hot. THAT hot? 2400 degrees Fahrenheit? Wouldn't that flash boil the water it's supposed to be soaking in? Yep, that hot. Still under the temperature of some solid-core gas-cooled nuclear reactors, though, so it can be dealt with. Should be embedded in a graphite matrix with helium coolant piped through, and the lead outside that. Also, now that I've rechecked my numbers, it would probably be best to surround it in tungsten. Almost as high an atomic number as lead (74 vs 82) and higher density to boot, both of which are important for gamma-ray shielding, and a high enough melting point (3695 K) to not immediately melt from the heat flux. Drill coolant holes and pump helium through, and it'd be alright. Layer the water outside the tungsten to weaken the fungus-inducing radiation. Mind if I make the appropriate edits? there's no story, if that makes sense? It's all spice, no meat (to mangle an analogy). Downvoted, and with a post made to draw attention to it so that maybe it'll tumble to -5.
just counteracted that downvote XD. Reenacting that downvote. I've never seen this before, and it just seems sorta bland to me. This one does not move me emotionally. There was a lot of work done on it, in this case I think all the scientific data is dulling the impact. The creepiness is minimal. I agree with the previous posters; spherical, no story. I do like the concept of partially extra-dimensional radiation, however. I am wondering if the Delta Radiation is analogous to Cherenkov Radiation? 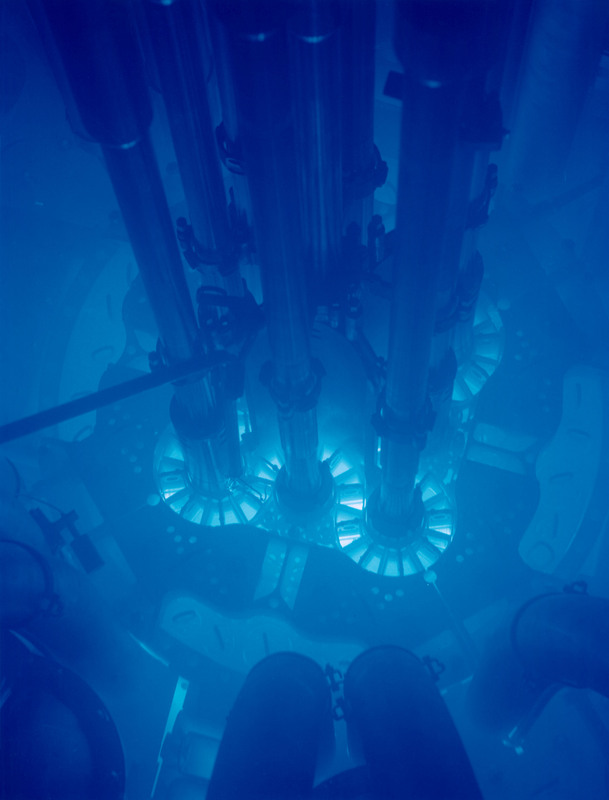 Cherenkov Radiation is responsible for that deep blue glow that emanates from the cores of Nuclear Reactors.